Transitional National What? Libyans Still Don’t Know Who Their New Leaders Are. 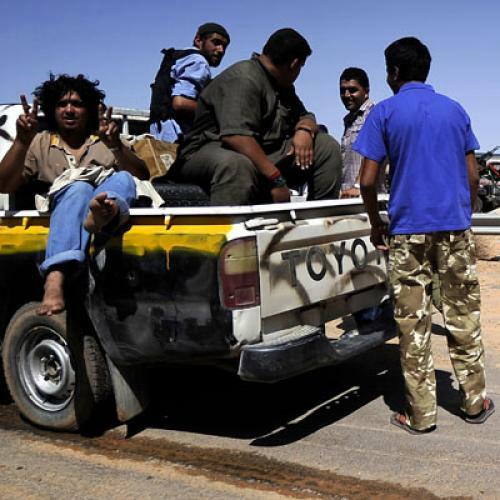 Tripoli—“I love them,” says Fawziyya Tarablusi about Libya’s National Transitional Council. But when asked to name her favorite member of the country’s new leadership, Tarablusi, an English teacher, drew a blank. She could identify only two of its members and knew nothing substantive about the people she effusively praised just moments earlier. Tarablusi is not alone. Throughout the Libyan capital of Tripoli, people are eager to embrace their new government, but they are hard-pressed to articulate why exactly they respect their new leaders or what precisely they stand for. The National Transitional Council, which has assumed responsibility for transitioning to a new regime, has been enigmatic since it was formed in the days that followed the country’s initial February 17 uprising. The council has drawn from a wide-range of activists, including lawyers, professors, and exiled dissidents—but in a country where politics had long been the exclusive domain of a handful of men bound by tribal links, marriage ties and decades-long loyalty to Muammar al-Qaddafi, NTC members still enjoy little name-recognition in most of the country. If the council's ties to the majority of the nation seem thin, that's because they are. Over the course of the six month rebellion, NTC members have worked hard to establish roots and develop relationships in eastern cities such as Benghazi. But in Tripoli and other western towns that remained under Qaddafi’s dominion until the rebels recently liberated them, the NTC was not able to make any inroads at all. As a result, the capital’s residents know almost nothing about the politicians who are now governing and will continue to do so for the foreseeable future (at the least, until the elections scheduled to be held eight months from now). Residents of Tripoli are fascinated by committee that has assumed control of the country, but their information about it is drawn straight from reports and talk shows on pan-Arab news channels like al-Jazeera and al-Arabiyya rather than from the longstanding grassroots debates in pre-revolutionary newspapers and coffee shops. Right now, almost everyone in Tripoli knows the names of the rebels’ two top officials: NTC Chairman Mustafa Abd al-Jalil and Mahmud Jibril, who is effectively the rebels' prime minister. But only a few people here can identify anyone else in the NTC. Indeed, Tripoli’s ultimately superficial relationship to the NTC is reflected in the city’s inordinate interest in Jibril, who has been attracting international television coverage for the past six months as he has shuttled between world capitals, though at the cost of removing himself from the opposition deliberations in Benghazi. “Abd al-Jalil knows the truth,” declares Dawi Talha, a resident of the capital. It is a refrain often heard about the former justice minister. He is alternately described as “virtuous”, “pious”, and “a good man.” One Tripolitian says simply, “Abd al-Jalil knows Allah. And anyone who fears Allah is a good man.” But none of the people I spoke with could say anything about his vision for a future Libya, or even what they particularly liked about his political outlook, beyond saying he was a “just person." Part of the problem is that the NTC conducts its affairs and debates in private. Even the selection of its members has lacked transparency. “I simply don’t understand the criteria they used to select their members,” notes a prominent political science professor at a Benghazi university. The first round of appointments largely concentrated on former political prisoners. When the NTC expanded its ranks in May, it announced a process by which local municipal councils would nominate residents. But some localities had no such bodies, requiring the NTC to make repeated exceptions as they shepherded notable Libyans into the group. There seems to be little rhyme or reason to the final membership. One member, Jamal Isa, seems to have been chosen simply because he had acquired celebrity for defecting from Qaddafi’s regime with a fighter plane decades ago. It is also possible that the opacity of the committee's activities is designed to obscure its dysfunction. Western diplomats privy to the NTC’s affairs say that the club not seldom finds itself trapped in extended debates over arcane political matters. The member who yells loudest often prevails. “It is completely unprofessional. It is like a backwater municipal council from Southern Europe,” says a Western official who has resided in Benghazi since the early days of the revolution. That perhaps should come as no surprise, given that the NTC is largely comprised of a group of figures with little political experience. That’s not to say all of them lack competence. Hassan al-Zaghir is a law professor with a doctorate in international public law and an impressive bearing: In one-on-one conversations, he clearly explains his vision of a future Libya and the challenges the country will face, moving easily from Arabic to French. But most other NTC members, even those with similar academic credentials, do not acquit themselves as well. Many are inclined simply to regurgitate vague slogans, offering mere P.R. to a society eager for more. What the NTC has in its favor, of course, is that it successfully oversaw a military campaign against a hated regime, one that was willing and able to employ ruthless tactics against innocent civilians. In doing so, the council won the admiration of a people who had largely given up on the prospect of earning freedom. But to secure that freedom for their nation, the NTC will need to soon offer both a more coherent political vision and tangible material accomplishments. Only then should Libyans be expected to be able to name more than two of the people who toppled the former regime.